A fire has broken out in warehouses containing humanitarian aid in the Yemeni Red Sea port of Hudaydah. The blaze, which is believed to have been caused by an electrical fault, has destroyed food supplies and fuel, the UN’s World Food Programme (WFP) said. Four warehouses were reportedly engulfed in flames as thick plumes of black smoke billowed into the sky. The port of Hudaydah receives critical aid for victims of the Yemen conflict, which has killed about 10,000 people. 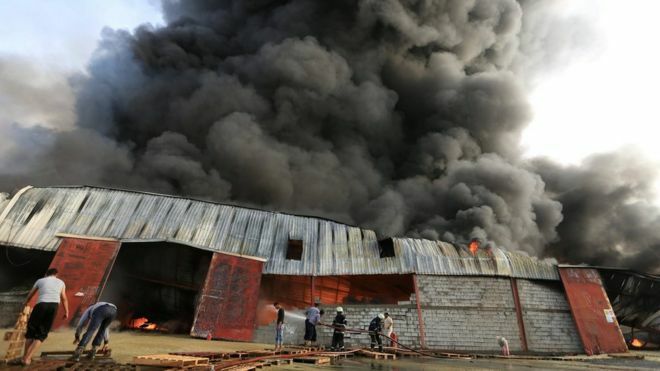 An estimated 50 tonnes of foodstuff was destroyed in Saturday’s fire, AFP news agency reports. Workers said the warehouses also contained a large number of mattresses that were meant for those displaced by the war. In 2015, an assault by Houthi rebels on the city of Aden prompted a Saudi-led multinational coalition to launch a military campaign. The UN has referred to the conflict in Yemen as “the world’s worst humanitarian crisis” with more than 20 million people in need of humanitarian assistance. In November last year, the Saudi-led coalition allowed aid deliveries to the port of Hudaydah and Sanaa airport following urgent UN appeals.